Japanese car giant Toyota has posted a 7.2% jump in quarterly net profits, beating expectations and surprising analysts. Net income came to 657.3bn yen ($5.88bn; £4.52bn), up from the 613.0bn yen recorded in the same period a year earlier. Many analysts had said they expected Toyota's earnings to be flat. But strong sales in Asia and some cost reductions on the home front helped boost the firm's bottom line. The firm said it sold 2,236,131 vehicles during the period, an increase of 21,020. "Toyota has been doing very well in parts of Asean (the Association of South East Asian Nations)," Janet Lewis, head of industrials and transportation in Asia for the Macquarie Group, told the BBC. "Particularly in Thailand, where Toyota is having a very strong year. And that has been supportive, because margins in Asean tend to be very good," she said. Who's the world's biggest carmaker? 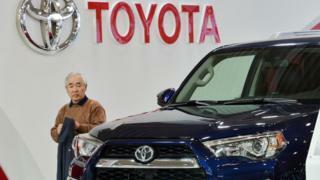 Toyota said its operating income increased from 574.2bn yen to 682.6bn yen - a jump of 18.87%. But the firm maintained that its full-year net profit would come in 2.12tn yen as trade war worries continue. Earlier this year Toyota said it expected to sell 8.95 million vehicles in the year to March 2019. On Friday, however, it revised this to 8.9 million "in consideration of the latest sales trends worldwide". Analysts have warned that potential US tariffs of as much as 25% on imported cars and car parts could in future hurt Toyota in its biggest market, the US. Major carmakers, including Fiat Chrysler, have warned that changes to trade policies are hurting performance. General Motors and Ford recently lowered their profit forecasts for 2018, citing higher steel and aluminium prices caused by existing US tariffs. But Macquarie Group's Ms Lewis said the impact of the existing tariffs had so far been minimal. "At this moment, the only tariffs are some fairly modest tariffs on aluminium and on steel," she said. "And that's raised some of the market prices in the US, [but] they've had a very, very modest impact. "The bigger materials impact has just been a general materials price increase - like resins." Ms Lewis warned, however, that any major changes to the North America Free Trade Agreement (Nafta) could have a much more damaging affect than tariffs on carmakers. "Toyota and other car makers have a very strong presence in North America, which of course includes Canada and Mexico, and so carmakers could be devastated by substantial changes to Nafta," she said. Toyota, more than the other automakers, would also be exposed if there were tariffs just on Japan, Ms Lewis explained, "because it does export a fair amount from Japan - but major changes to Nafta would hurt even more". In China, where Toyota had been lagging behind Honda and Nissan over the last couple of years, Ms Lewis said Toyota was now doing "extremely well". "The new Camry and the expansion of its production capacity in the China market is leading to double-digit growth this year," she said. In May, Toyota posted a record full-year net profit of 2.5 trillion yen ($23bn) on, up 36.2% from a year earlier. Vehicle sales for the year to March 2018 came to 8,964,394 units.